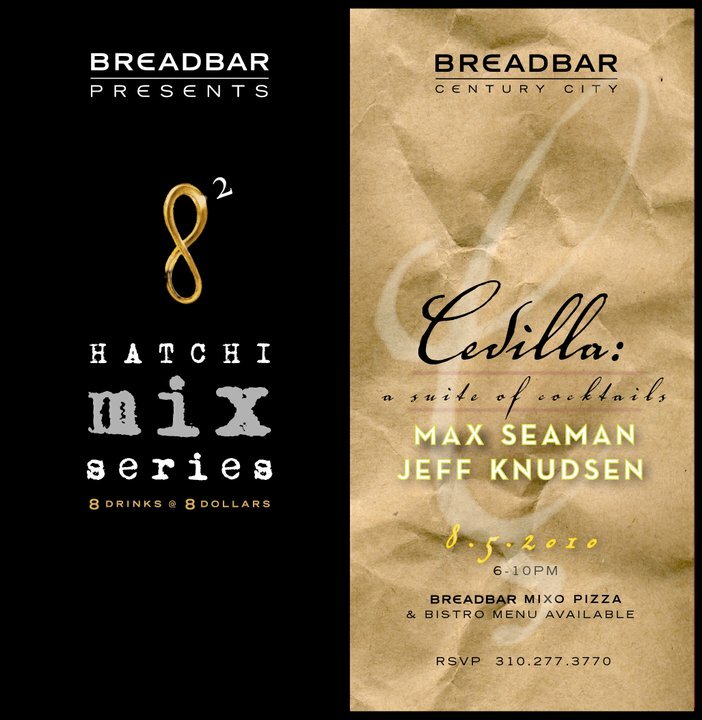 On Thursday, August 5th, the Hatchi Mix Series returns to Breadbar Century City, featuring guest mixologists Max Seaman and Jeff Knudsen (Comme Ça) and their menu of specialty cocktails. As reported by Josh Lurie, Matt Biancaniello (The Library Bar at The Roosevelt) cancelled his previously scheduled Hatchi Mix appearance. With only two weeks to go before the event, Hatchi Mix curator Devon Espinosa (The Tasting Kitchen) was able to bring in Seaman and Knudsen, who are presenting “Cedilla: A Suite of Cocktails” on Thursday night. Inspired by the popular Hatchi Guest Chef Series, Hatchi Mix invites imbibers to experience the evolution of the cocktail, from the classic era to its cutting edge, through a monthly series of special one night-only menus. Taking a cue from its name (hatchi is the number “8″ in Japanese), each unique Hatchi Mix menu features eight cocktails, priced at $8 each. To go with the Comme Ça duo’s libations, Breadbar will serve its Pizza Mixo menu, featuring crisp pizzas made with its famous bread starter, as well as the full bistro menu. The Hatchi Mix launch featured “Vive le Cocktail,” a menu of classics from Espinosa. Subsequent installments have showcased cocktail menus from former Caña GM Joel Black (“Rum Amok”) and Rivera mixologist Julian Cox (“Tequila in 3 Magical Acts”).